This post is an earlier one which came straight from the heart. Michael has been my reason for watching Formula One since 1997 , while my fellow classmates were bored by the loud sounds of engines roaring , i on the other hand loved every moment of it and enjoyed it to full , most of my friends wouldnt even understand the concept of pit-stops and tyre changes then. But my interest was not in these array of machines vrooming around the track but Michael , i remember an action replay once , cars negotiating a chicane , one car negotiated it and the commentator said “this is how the pros do it” , then it was Schumi’s turn and he simply glided “This is how Michael Schumacher does it”. My mind was made then and there , such great talent , such precision , such superiority, F1 was going to be my fave sport and so it remained even afterwards, season after season , seeing Schumi win , seeing him lose too, but never once did Schumi look old to me , that same graceful drive each time. Then there were bad times too , when Schumi broke his leg in Silverstone missing most part of the season, it was bad , i missed most of the season as F1 without Schumi is like Golgappa without? (Beef without mustard for the english), A car without tyres etc. 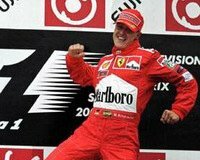 Then one day in the morning , Japenese Grand Prix Qualifying , thee he was Michael Schumacher’s name was there , i felt elated , Schumi was back and so was my interest. I dont have words to say how i feel right now, but if Schumi ever reads this (lots of time on hand now) , thanks for giving me my passion for F1. This post shall be a tribute to the great Schumi , hope you come back. “What motorsport has given to me in more than 30 years, I have loved every moment of it, good and bad. “Words are not enough and whatever I say now will never fully express how much I love this fascinating world of motor sport and all it has given me. I am profoundly grateful for everything I have had. “It has been a tough decision to not work at this level. The day has come and I felt this is the moment. FANTASTIC tribute to the F1 master. Thank you! Great post.Schumi is so special for this game…formula one won’t attract me without him. @anna – yep , i too feel the same way , but will try and watch for the sake of Ferrari.